Not completely undamaged the Team De Rooy Iveco’s reached the finish of SS11. But the result was nonetheless: Federico Villagra took the lead in the rankings. Due to a penalty for a broken strap in stage 10, which was calculated Wednesday, the margin of the Argentinian is only small: 1:07 minutes. "But that does not matter: The lead is the lead," Villagra said. For a long time it seemed that Villagra was going to win the stage in the dunes of Fiambalá, but at the last moment MAZ driver Sergej Viazovich stuck out. Still, the ride was more than enough to turn a 24-minute arrear on Kamaz´ Eduard Nikolaev into a 16-minute lead. Later on in the evening, the penalty was taken from that. The equally famous and notorious Fiambalá stage was rightly labeled as the Super Special. The classification was completely turned upside down. 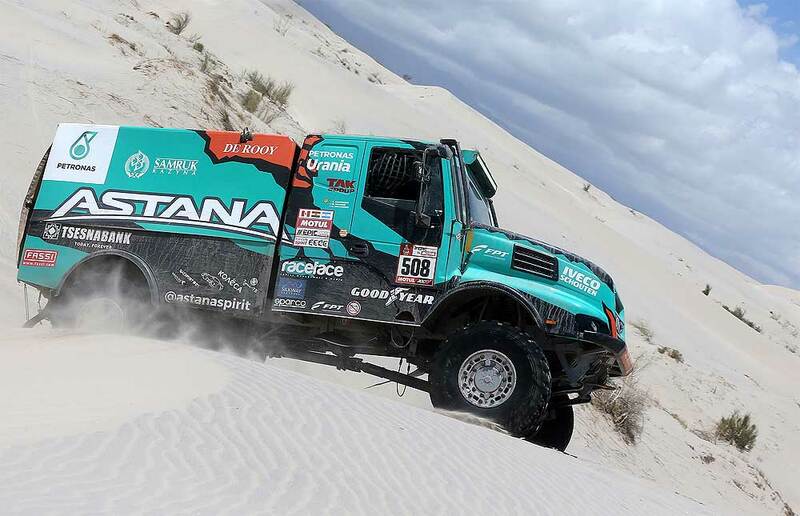 Villagra took the lead, but teammate Ton van Genugten lost two hours due to an unfortunate landing in the dunes, where the joint of the steering pump of the Iveco Powerstar broke and Van Genugten no longer had power steering. Mechanic Bernard der Kinderen started to repair with the help of Van Genugten and navigator Peter Willemsen. "But probably we wanted to be a bit too fast, because after half an hour the oil of the power steering leaked out and we had to start over again." All in all, it took more than one and a half hour. The third time that Van Genugten had to stop was because of a puncture. The fourth time was due to some further damage from the breached nose of the Iveco Powerstar. "The main switch went off. In total we have stood still four times," says Van Genugten, who dropped to 7th in the ranking. Villagra did not come off unscathed either. "We had a puncture, which took a quarter of an hour," said the Argentinian. "It was really difficult, with lots of dunes. That is not bad, but it was heavy, ‘slow’ dunes and difficult to climb." Of course Villagra was very satisfied with the fact that he is in charge of the truck category in his own country. "Very proud. This is an extra motivation, because in the coming days we will still get some very difficult stages, in which everything can happen. The lead is minimal, but that does not matter. The lead is the lead and we try to hold on to that until Cordoba." 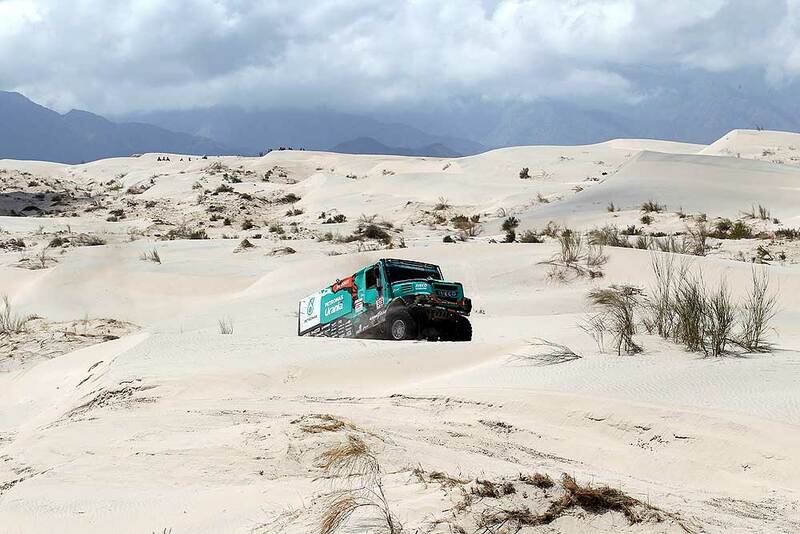 Between the success of Villagra and the bad luck of Van Genugten, the third Team De Rooy Iveco, Artur Ardavichus, drove a solid SS11, which earned him 5th place in the standings. The numbers 5 (Ardavichus) and 7 (Van Genugten) are however separated by less than three minutes.